On December 21, 1885, executives of the Chicago and West Michigan Railway formed the West Michigan Park Association (WMPA) and purchased 54 acres of land on the north side of the harbor near Lake Michigan. By May 1886 WMPA purchased 20 additional acres. The association, made up mostly of Grand Rapids residents, endeavored to make it one of the most popular resorts in Holland with lots for summertime resident cottages and a hotel for other visitors. Ottawa County Surveyor Albert Peck platted the resort with 150 cottage Lots (typically 50-foot by 100-foot), streets, and a lot for a hotel. 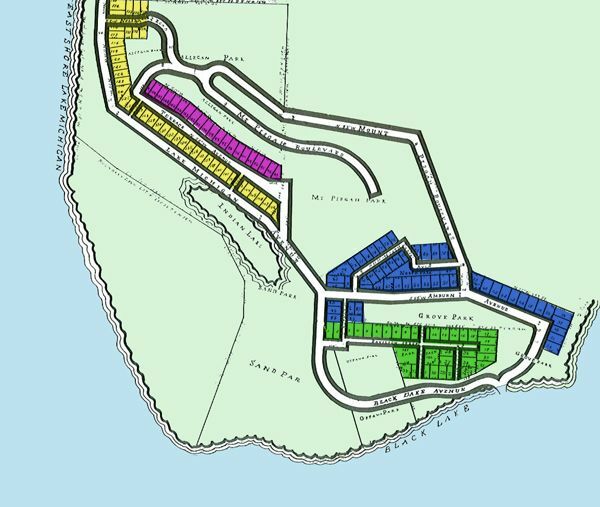 He designated the majority of the land as park area owned in common by cottagers, with each residential Lots abutting one of the parks, which would never be developed. Each cottage lot was adjacent to one of these parks, to retain the natural undeveloped character. The Chicago and West Michigan Railway (later the Pere Marquette Railroad) played a key role in the development of Ottawa Beach. With only a couple of exceptions, the several avenues and boulevards indicated on the plat map exist only as concrete sidewalks or, in the case of Terrace Walk, as an undulating elevated wooden boardwalk. Many of the cottages on Terrace Avenue and elsewhere in the plat are accessible only on foot. No records have survived regarding the factors the land owners considered when planning this unique resort community, which was largely developed between 1887 and 1930. The capital stock of the company was $10,000 (worth about $250,000 according to an inflation calculator) divided into 400 shares, and each subscriber had to take four shares. In June 1886, the original nine directors selected their lots and then the remaining lots were numbered, those numbers written on individual slips of paper and put into a hat. The other association members chose there Lots by drawing a number from the hat. By 1890 twenty summer cottages had been erected. Many more soon followed. Among the earliest cottagers were prominent business people, furniture makers, railroad officers, and politicians. For more than a century, the same families returned each summer, often occupying the same houses for decades. From the 1930s through the mid1960s future U.S. President Gerald Ford spent many summer vacations at Ottawa Beach, first at his parents’ cottage and then a one he owned with his brothers. 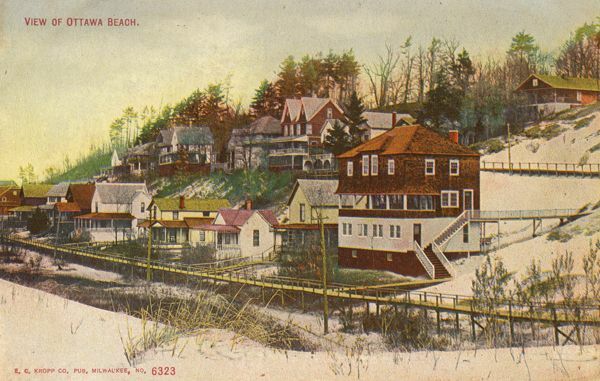 This photo shows the cottages on Terrace Avenue, called the upper boardwalk, and Lake Michigan Avenue, the lower walk, which was an elevated wooden walkway skirting Indian Lake, the little pond which was all that remained of the original natural channel connecting Lake Macatawa with Lake Michigan. Note the relative lack of vegetation in front of the cottages. By the middle of the century, drifting sands would create large sand dunes in the sand park in front of the lower walk, effectively blocking their view of Lake Michigan forever. 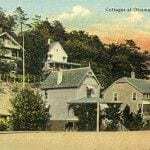 The three cottages in the upper right of the photo were built in 1900 by General Lewis Heath. 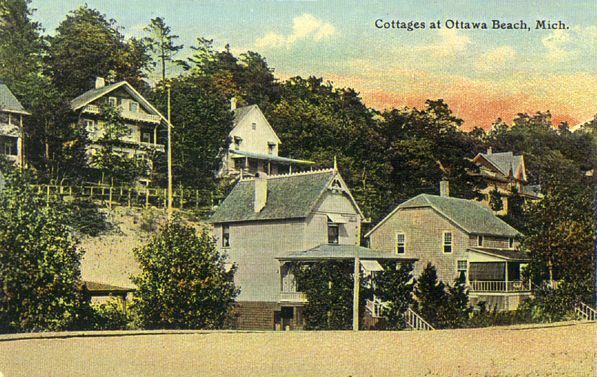 With the demise of the Ottawa Beach Hotel and rail service and the opening of Ottawa Beach Road and Holland State Park, Ottawa Beach passed from being a resort destination to being simply a neighborhood of cottages by the lakeshore. Certainly the Great Depression of the 1930‘s and the World War II era of the 1940‘s were quiet years at Ottawa Beach. In the 1950‘s, the post war baby (and economic) boom again made Ottawa Beach an attractive summer destination for families. The Chicago and West Michigan Railway experienced many financial problems and in the 1890s, it proposed creating and additional 100 cottage lots in the undeveloped park areas. The existing cottage owners cried foul and got an injunction to stop the land grab. Years later, the commonly-owned property resulted in a disagreement between Ottawa County and cottage owners over the extent of public use to be allowed on the properties. For many years, Ottawa County’s goal was to transfer the properties to the State of Michigan to be managed through Holland State Park. After over 10 years of effort, the transfer to the state of the undeveloped Park parcels was determined unfeasible and Ottawa County Parks and Recreation (OCPR) decided to proceed in developing a master plan for these properties. OCPR and property owners signed a consent agreement giving OCPR ownership of the Parks, which are now known as the Historic Ottawa Beach Parks. Click on the individual section maps for detailed information about the historic cottages in those areas. The Historical Ottawa Beach Society guarantees neither completeness nor accuracy of the information provided. Additions or corrections to these records may be brought to that attention of the webmaster. Pavilion Street, Black Lake Avenue, and on the northwest side of Ottawa Beach road between the pump house and Auburn Avenue. Both sides of Auburn Avenue, along the plated, but never developed North Avenue, and on the south east side of Ottawa Beach Road between the Ottawa Beach General Store and the U. S. Coast Guard Station. Along Terrace Avenue, often referred to as the upper boardwalk. Located along Lake Michigan Avenue, often referred to as the lower boardwalk, and along the Lake Michigan Beach front on the north west corner of the plat.